'Trump of Fear'. September. 07, 2018 08:09. pisong@donga.com. “Real power is fear.” Not the words you would expect to hear nowadays, perhaps centuries ago, by Chinese philosopher Han Feizi or Italian philosopher and writer Machiavelli, but it is. U.S. President Donald Trump said these words in an interview with Bob Woodward, an associate editor of The Washington Post who covered the Watergate scandal. 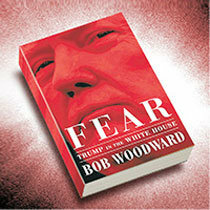 The word "fear" is the title of a book recently published by Woodward. In the Chinese movie "Hero," there is a scene where Emperor Qin is frantically chased by assassins, royal guards do nothing but stand stiff, unable to move in the absence of the emperor’s orders. One can imagine what the price would be if the guards dared not to follow royal orders. Maybe not quite to that extent, but an unusual event took place on Wednesday, when a high-ranking official from the Trump administration wrote an anonymous column on The New York Times, introducing him/herself as "resistance" to Trump. In the book "Fear," there is a passage where White House national economic adviser Gary Cohn secretly confiscates Trump’s letter to scrap the U.S.-Korea FTA, but the president remains oblivious. The fact that such a thought could be impulsively conceived and immediately forgotten is more shocking that the scrapping of the deal itself. Fear can stem not only from terror but from the unpredictable. However, some choices that may appear like a madman could be intentional. President Trump orders to prepare for preemptive strike against North Korea, but makes flattering remarks to North Korean leader Kim Jong Un as a negotiator. In his book, the “Art of Negotiation," it says that it is important to reveal to your counterpart that you are not desperate for only one option, but open to both options that may appear contrasting. Woodward would have known better than anyone the negotiation tactics of the real estate developer-turned President, but he might have turned a blind eye. When Trump won the election, the Washington Post assembled a team of 20 reporters to validate Trump. Woodward’s new book is another row with Trump at this critical juncture just two months ahead of the midterm elections.